There was originally a temporary iron district church, built in 1879 (VCH 6(2) p192). A permanent church replaced it in 1899-1900, designed by W G Scott (foundation stone). It is in the lancet-style, low, aisleless and built of brick, seen as the most economical of materials, inside and out, with a stone east window and chancel arch. The steep roof has white-painted dormers and a timber belfry. The interior departs from strict economy with wall-arcading throughout, in which the nave windows are set. The plan called for transepts (CDG 86 (1901) p22) and the blocked double-arches for these are visible. The west end was incomplete at the time of building (Arch J 10 p217) and in any case was altered in 1974, when a hall was added to the west, linked by a vestibule. 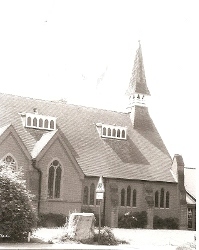 In 1997-98 a big new north porch, also of brick, was added (church website). 1. (East window, centre light) Clayton and Bell, 1901 (ibid). 2. (South chancel, first and north chancel windows) Jones and Willis, 1926 and undated (one signed). 3. (North nave window) Engraved figure, signed by I Irwin, c1962. Font: Plain and octagonal, dating from the same time as the church.